Self-convoked people participate in the human chain for the political prisoners of Daniel Ortega’s regime, in the middle of a strong police force deployed in the area of the Rubén Darío roundabout, Metrocentro. Daniel Ortega “is terrorizing his own people”. Nikki Haley, United States ambassador to the United Nations, assures that the UN report on human rights violations in Nicaragua confirms what the United States has been saying for months. President Daniel Ortega will ask Costa Rica for a list of Nicaraguans who have fled because of the socio-political crisis. The Costa Rican Foreign Ministry informs that this information is impossible to provide, since it is confidential. On the International Day of Victims of Enforced Disappearances, in Nicaragua the number of missing persons is concerning, according to the report of the Office of the United Nations High Commissioner for Human Rights (OHCHR). President Daniel Ortega describes the High Commissioner for Human Rights of the United Nations as an “instrument of terror and lies” for his report on Nicaragua. Where do these people get the money? They are not businessmen, the American senator; Marco Rubio criticizes the level of life of the Ortega-Murillo family. A group of 26 political prisoners who are in the cells of the La Modelo Penitentiary System have been on hunger strike for three days in protest at the mistreatment they receive and to demand their prompt release. The Orteguista Mayor office of Masaya appoints Commissioner Ramón Avellán, “beloved son of Masaya”. Avellán has been designated to lead the repression against the demonstrators that left at least 35 dead in Masaya. Silvia Torres, president of the Roots Group that brings together producers of hammocks, handicrafts and wood articles indicates that the crisis in Nicaragua has affected exports to El Salvador, Costa Rica, the United States and Spain. Experts in economics warn that Nicaragua’s economic growth will be in negative marc, as the projections decline to 1.8 percent due to the socio-political crisis. Ministry of Foreign Affairs of Nicaragua keeps silence in response to requests from the Meseni of the IACHR. Despite the lack of support from the Government, the coordinator of the Meseni considers important to continue monitoring the situation of the country and protecting the victims. Lawyers of the Permanent Commission of Human Rights (CPDH) denounce that the witnesses in defense of their human rights activists have been intimidated and detained so that they do not attend the hearings. 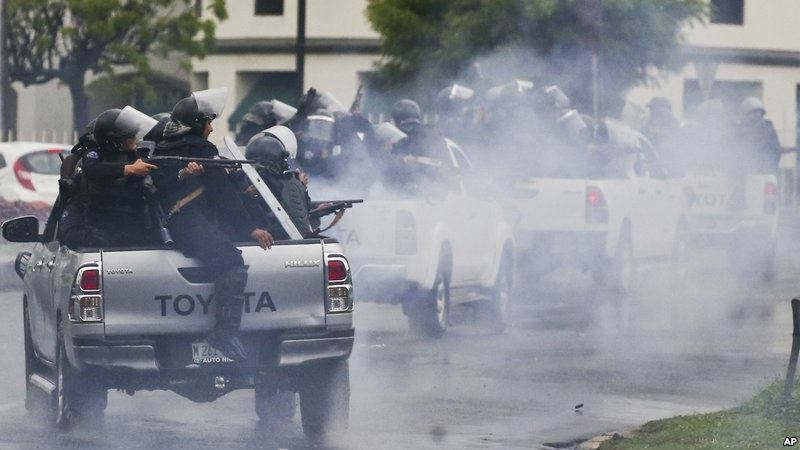 Daniel Ortega reinforces his control over Nicaragua. The Economist assures that in spite of maintaining the repression, the Government of Nicaragua could be weakened by an eventual economic depression. Within the framework of the International Day of Victims of Enforced Disappearances, Cenidh demands the cessation of government repression that has left dozens of reports of missing persons. 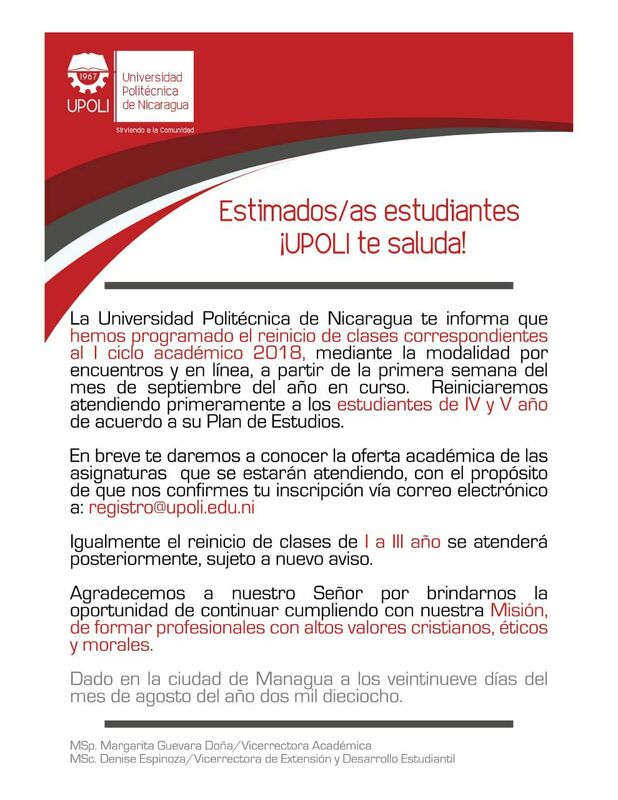 Authorities of the Polytechnic University of Nicaragua (Upoli), where students were entrenched, report that they will restart classes in the first week of September. 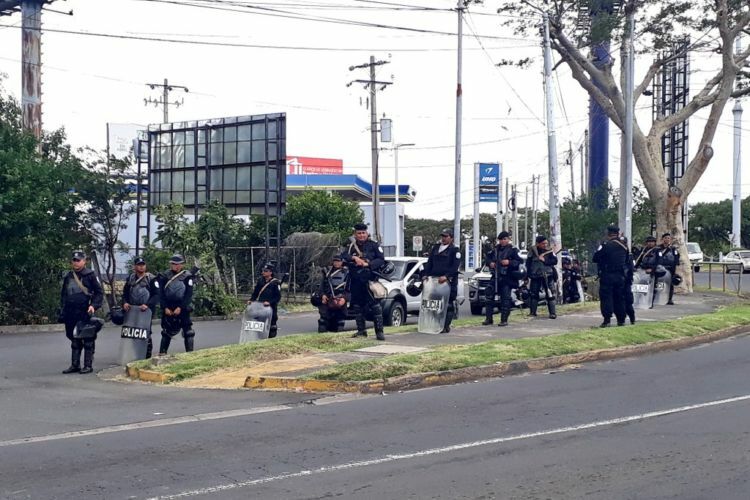 The writer Sergio Ramírez in an interview with Aristegui News indicates that the stage of crude violence and deaths in the streets lasted the first 100 days of protest and now the Government criminalizes the protest. Civic Alliance for Justice and Democracy meets with representatives of the Yatama indigenous party to analyze the call for regional elections announced by the Ortega-Murillo regime for March 2019. The political leadership of the government party in Granada distributes a new militancy record to ensure party loyalty among state workers.